All my life I have been organized. I look at empty containers and see the potential to contain something! So it’s natural for me to turn to some sort of box or tray to put things in. When we go to people’s homes and see drawers filled with items, with no way to differentiate one item from the next, we immediately know what is missing. There are no containers – no compartmentalization. People who are not naturally organized may not realize that is what’s missing, or understand what a difference adding this simple component will make. It seems so silly to think a box will change things that much. But it does. Does it matter what kind of containers you use? Sometimes, yes. 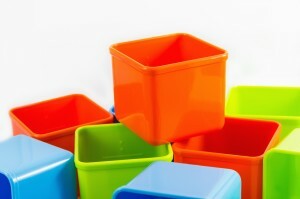 To truly make most efficient use of a space, the containers you use are important. It’s not life-altering important, but if you are dealing with a lot of stuff in a small space, it is very important. If it’s too round then there’s wasted space. If the lid stays attached, it’s hard to access – little details like these are important. Are You Using Containers in the Best Way? Give us a call. We’ll be happy to come to your house or apartment to help you discover how containers can make your space more appealing and more comfortable because they will be clutter-free.